How to watch Despicable Me 2 (2013) on Netflix USA! Sorry, Despicable Me 2 is not available on American Netflix, but you can unlock it right now in the USA and start watching! With a few simple steps you can change your Netflix region to a country like Panama and start watching Panamanian Netflix, which includes Despicable Me 2. We'll keep checking Netflix USA for Despicable Me 2, and this page will be updated with any changes. 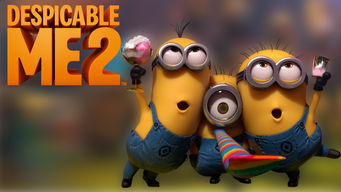 Despicable Me 2 is not available in USA BUT it can be unlocked and viewed! Arch-villain Gru and his three orphan girls return for more shady exploits in this wacky animated feature voiced by some of Hollywood's biggest stars. Mix a lovely spy, two supervillains, three spunky girls. Top with crazed purple minions, lipstick Tasers and fart guns! There is a way to watch Despicable Me 2 in the USA, even though it isn't currently available on Netflix locally. What you need is a system that lets you change your Netflix country. With a few simple steps you can be watching Despicable Me 2 and thousands of other titles!